2019 Spring Recreation Soccer Registration is still OPEN. Go to the Recreation Soccer tab for more details and registration link. UFA 2019-2020 Travel Soccer Teams are hosting player evaluations. Please see the Travel Team Pages for specific information. All interested players should contact the coach directly. 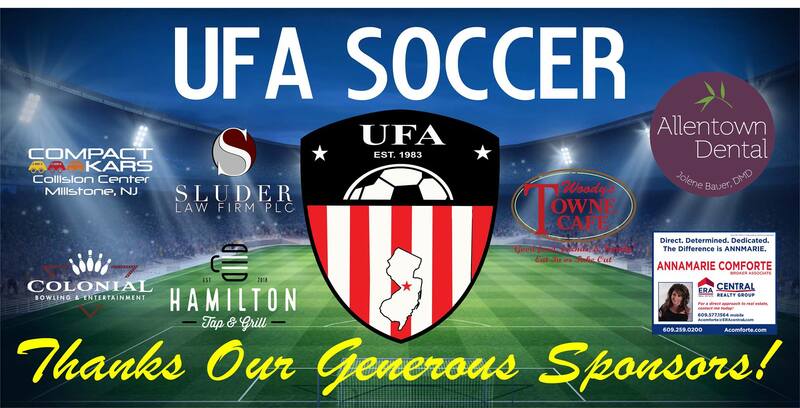 The Upper Freehold/Allentown Soccer Association (UFA Soccer) is located in Upper Freehold, NJ and is a 100% volunteer organization. UFA Soccer was formed and remains dedicated to providing the local youth with the opportunity to learn, enjoy and compete in and succeed at soccer. We offer a variety of programs all of which are designed to develop and increase playing skills, teamwork and sportsmanship. Our recreation division offers programs for youth players from the pre-k through 8th grade levels. We are constantly looking for ways to update and improve the experience for our recreation soccer players and we work with other local soccer associations and leagues to provide superior opportunities for our players. The travel division offers teams and league competition for players who 'want more' soccer and are willing and able to dedicate the time and effort to playing at a higher level. These teams play in a variety of leagues around the Garden State and will quite often play in tournaments inside and outside of NJ. Some of our teams have even ventured outside of the United States to play in tournaments and to experiece the global game. Regardless of what level our players are at, UFA Soccer is there to assist them in getting the most from the 'Beautiful Game'.